Smart Traffic & Road Safety Summit aspires to identify and analyze Smart Traffic and Road Safety challenges in the UAE and the Middle East. 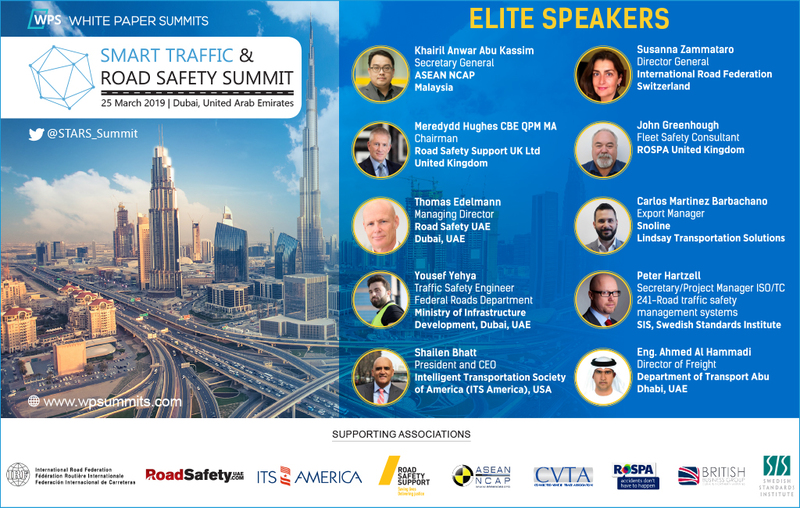 Smart Traffic & Road Safety Summit is scheduled to take place in March 2019 in Dubai. Given the tremendous developments in UAE and the Middle East and the expansion of road networks, evolution of road transport and the new policies and strategies to overcome traffic related obstacles, Smart Traffic, Road Safety and Accident Prevention have become more critical than ever. • Meredydd Hughes – Executive Chairman, Road Safety Support UK, Ltd.